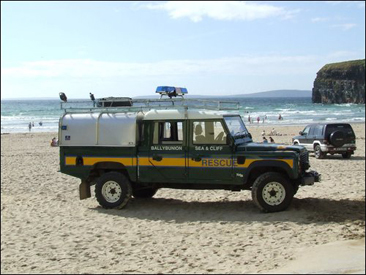 Ballybunion Sea & Cliff Rescue was founded in 1986 to provide a rescue service to the locality of North Kerry and West Limerick. 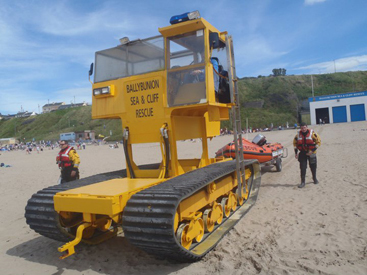 Although maintaining the name Sea & Cliff Rescue, cliff rescue was taken over by the Ballybunion Unit of the Irish Coast Guard in 1991 (then the Coast and Cliff Rescue Service). The Irish Coast Guard unit based in Ballybunion is a separate organization and should not be mixed up with BSCR. Equipped with a D class inflatable boat, & a new Atlantic 75 RIB, BSCR covers the coast and Shannon Estuary from Ballyheigue, Co Kerry to Foynes, Co. Limerick, and inland to Abbeyfeale, Co Limerick. Having a declared night time capability also means we overlap with neighboring services to cover that area in the hours of darkness. 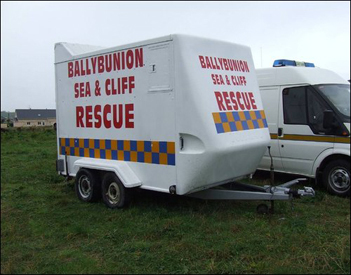 As well as providing 24x7 Sea & Cliff Rescue, the volunteers also provide First Aid and Ambulance assistance at a handful of horse races and other events around the Ballybunion area. We rely on public donations and all year round fund raising to raise the €45,000 needed to keep the service afloat each year. None of our members are paid and all give their time freely. The crest of Ballybunion Sea & Cliff Rescue Service is made up of an anchor in the centre, a ring buoy around a figure of 8 (for climbing) and a plan view of a D Class boat, all of which is outlined by a gold rope. 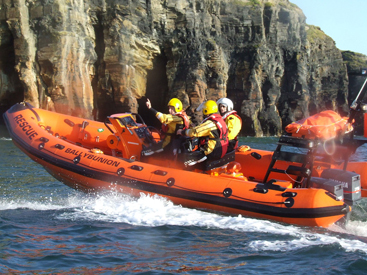 The EA-16 D-Class inflatable boat is the work horse of Ballybunion Rescue. The boat is powered by a Mariner immersion proof 2 stroke 40 hp engine and is built by the RNLI to rescue spec in Cowes, UK. The boat cost in the region of €20,000 in 2009. This fast, light inflatable can be used in many locations but is especially suited to surf, shallow water and confined locations......all of which combined makes Ballybunion one of the most dangerous of rescue locations. 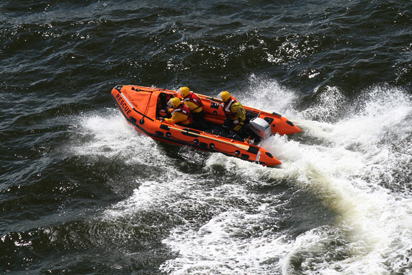 The boat was originally introduced by the RNLI in 1963 but has continually evolved ever since. The Atlantic 75 (B-Class) is a Rigid Inflatable Boat built by the RNLI in Cowes, UK. The boat, which unlike other rescue boats, is built to rescue specifications and is solely built for rescue only and not pleasure use. The RIB cost the service €170,000 and was delivered in April 2010. BSCR's Atlantic 75 is named the "Tommy C" after Tommy and Clara Duggan. The original Atlantic 21 was named the "Clara T" after the Duggan family of Ballybunion made the single biggest donation in the history of the service to go towards the A21. The committee of 2010 decided to was only right to continue to honour the family. The new A75 was officially named by Derek Nagle, grandson of Tommy and Clara. The Atlantic 75 was first introduced in 1993 to replace the Atlantic 21. The A75 has many updates from the A21, the biggest one being the addition of a ballast tank that can be filled or emptied while the RIB is under way. Construction - Polyester glass reinforced fibre hull with marine plywood stiffening. Hypalon coated nylon tubes. Marooka Launching Vehicle - this is an adapted dumper truck designed by our Chief Coxswain and modified locally for us. Driven by hydraulics with is capable of gaining the depth needed in the surf to launch the Atlantic 75 rescue boat. Landrover 130 defender is used primarily as a vehicle for towing the rescue boats to alternative launching locations. It is also a response vehicle, a shore search vehicle and a relay station if the boats are out of range from the rescue station. The vehicle is fitted with a plasma rope winch, emergency lighting and a roof rack for storage. Off Site search trailer - This trailer is used for searches which are away from the rescue centre. It is fitted with a small sink, seating and a storage area and is mostly used to give members an area to rest out of the rain in search situations. If you planning a trip to Ballybunion Sea Rescue or indeed a course with them why not take advantage of our special rates booked in advance.